What? You mean we shouldn't imitate Hollywood? 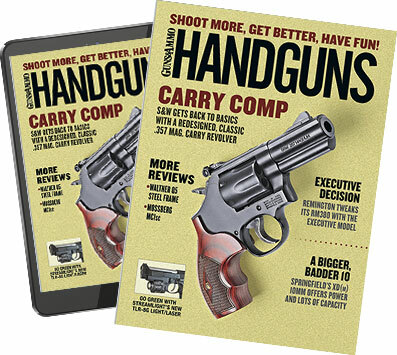 Fads in guns and holsters come and go--think Clint Eastwood in the 1971 movie "Dirty Harry," when he wore and used an S&W .44 Magnum Model 29 in a shoulder rig. The ensuing craze for both was overwhelming, despite both being impractical if not downright painful to shoot and wear. But the shoulder holster's revival pre-dates Dirty Harry. In 1968, Steve McQueen played Lt. Frank Bullitt in a movie of the same name and wore an upside-down shoulder holster (meaning the gun was pointed directly into his armpit) in which he carried his Colt 2.5-inch .38 Special Diamondback revolver. At that time, McQueen was the very definition of "cool," and a number of my gun-carrying associates adopted this shoulder rig (but not the gun, which had to be the one issued and authorized for on-duty carry). Well, a problem arose fairly quickly. Our issue revolvers were either the four-inch-barrel S&W .38 Special Model 15 or the four-inch S&W .357 Magnum Model 19, and we had to regularly qualify with one or the other over a bullseye course. The course required two five-shot strings fired in three segments at 50 feet shooting slow, timed and rapid fire. To score well, single-action shooting was more productive, but the times were tight, particularly for timed and rapid fire--five shots in 20 seconds and 10 seconds, respectively--so any aid in cocking the gun one-handed was a good thing. Some guys had an S&W target hammer and trigger installed, which worked quite well for this qualification. The rub came when the revolver, enhanced with target hammer and trigger, was coupled with the upside-down shoulder rig, as everyone found out one day when one of the guys in the office did no more than drive to work wearing this combination. When he took off his coat, a few of the other guys noticed something was decidedly wrong. His gun was cocked in the holster, and the muzzle was pointed directly up into his armpit. Our agency had a rule of no exposed firearms in the office, which meant he had to draw his cocked gun to put it out of sight. Fortunately, before he could do that, others acted. Without a word, one moved the muzzle away from the guy's body while jabbing his finger between hammer and frame, at the same time a few others made sure he didn't move a muscle. After the gun was carefully removed, decocked and unloaded, the "how this came to be" scenario was quickly determined. The word spread, and shortly even the diehards discarded the rig. Such questionable gun and holster combinations continue to this day, though. One good idea which has become pretty much passé is the tactical thigh rig, worn in the Middle East war zones. When the troops moved on foot, the leg holsters worked well, but once vehicles became the primary mode of transportation, they were quickly found to be difficult if not impossible to draw from and the gun was being battered by banging against the all-metal vehicle. The point is, you and your particular needs--not a "cool" factor or peer pressure--should dictate what handgun you carry and how you carry it.